There are bound to be plenty of bottles opened this Christmas, so why not gift one of these superb Gearstick Bottle Stoppers? The tapered rubber seal ensures they’re suitable for all sizes of wine bottle and many other different types of festive tipples including port and cherry. One of the bottle stoppers is made from rose-coloured wood with chrome detailing; another is wooden with a painted vintage white finish and the other is all chrome similar to the style on a Ferrari Dino. This set of cheese knives has proved one of the most popular items in our shop, and it’s not difficult to see why. These drop forged stainless-steel knives are ideal gifts for classic car enthusiasts that also have a penchant for cheese! Available either as a set of two for £30, or singly for £15. Depicting the dials of some of the most famous motor cars, these Speedo Clocks are ideal gifts for classic car enthusiasts, and an make an attractive addition to any man cave, office or kitchen. Available in the design of Ferrari, Austin Healey or Bentley Speed Six, these clocks feature a stained wooden frame and have a German quartz movement powered off a single AA battery. If you or your partner are the owner of an open-top sports car, you’ll appreciate that the British weather isn’t always quite as warm as it looks when rushing through the countryside at speed! These Union Jack Travel Blankets make ideal gifts for classic car enthusiasts and are a luxurious choice for wrapping up at motoring events, using as a picnic blanket or simply for throwing across your knees when the roof’s down. Each blanket is manufactured from real lamb’s wool made by one of the last vertical woollen mills in Yorkshire, where the wool is spun, dyed and woven all in-house. If you’ve been to one of our events this year and noticed us wearing snazzy Classic Motor Hub Jackets, it’s now possible for you or your loved-ones to truly feel like part of the Motor Hub team. These jackets were made to the meet the demanding specifications laid out by our team, and as such are very high quality and made to last. Each jacket is highly water resistant and windproof, versatile and good looking. They come in a wide range of sizes and make perfect gifts for car lovers and motoring enthusiasts who love The Hub or want a smart jacket to wear in their open-top car! Give the classic car enthusiast in your life somewhere stylish to lay down their drinks over Christmas and New Year with this set of four British-made ceramic Retro Formula 1 Coasters. Each tile depicts classic images of European Grand Prix from the 1930s, 40s and 50s and will look great in an office, man cave or snug. Also available in designs featuring spitfires and famous racing grand prix drivers. It’s rare than men survive a Christmas without at least one pair of socks being gratefully (or perhaps not so) received. If you’re looking for socks for your loved one this Christmas, why not buy them a pair they’ll wear with pride? 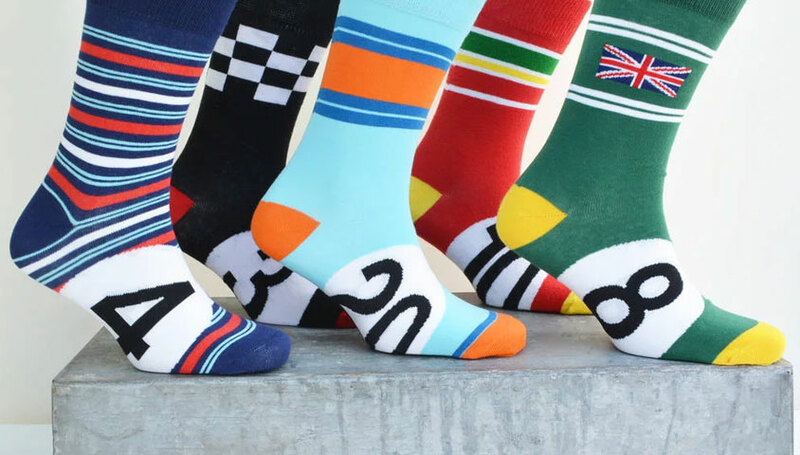 These Motoring Leg-End Socks come in a variety of designs that motorsports lovers will appreciate. Choose from Martini racing stripe, Gulf racing blue, British Racing Green, Ferrari Red or Chequered Flag socks priced at just £9 a pair. We hope you now have some inspiration for finding perfect gifts for classic car enthusiasts, but if nothing here quite fits the bill, don’t forget to have a good browse on our online store. There are plenty more automotive gifts and accessories that would make great Christmas gifts that we haven’t featured here. You can also visit us at The Classic Motor Hub and browse our store in person any weekday between 9am and 5pm, and at our motoring events, details of which can be found on the events page.